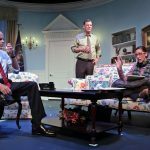 David Mamet’s Oval Office satire is a laugh-out-loud, politically incorrect, no-holds-barred look at one day in the life of an egomaniacal and beleaguered American commander-in-chief seeking reelection. Meet incumbent U.S. President Charles Smith. His party affiliation is neither clear nor relevant; his most significant identifying characteristic is that he is undeniably and irredeemably venal. And unpopular. 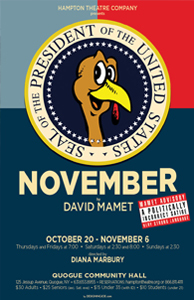 Premiering on Broadway in 2008, David Mamet’s scathingly satirical take on American politics in November remains eerily relevant in this 2016 election season. 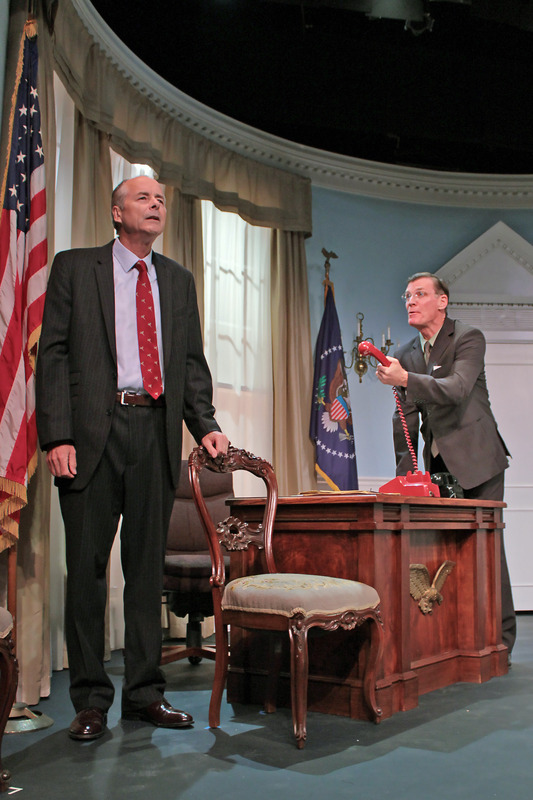 With Mamet’s trademark no-holds-barred style, November is a caustic characterization of the egomania and moral elasticity that infect too many politicians, and the kind of power-madness that’s a danger in any elected official. David Mamet is a prolific and Pulitzer Prize–winning playwright, author, screenwriter and director. 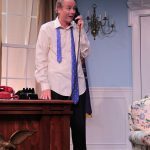 As a playwright he has penned a vast body of work and is perhaps best known for Glengarry Glen Ross (produced by the Hampton Theatre Company in 2008). The 1982 hit won him the Pulitzer Prize for drama as well as the New York Drama Critics Circle Award, and he later adapted the play for the big screen, garnering an Academy Award nomination. Other plays include American Buffalo, Oleanna, Sexual Perversity in Chicago, Duck Variations, Boston Marriage, Race and The Anarchist, among others. Mamet has also written screenplays for more than 20 films, including The Verdict and Wag The Dog — he received Academy Award nominations for both—The Edge, and the 1981 version of The Postman Always Rings Twice and Hannibal, both adaptations of novels. His work is characterized by dark themes played out by often-desperate characters who veer from the truth to manipulate others for their own selfish ends. Growing up in Chicago, Mamet was taught by his father, an attorney, to listen, to question everything, and to express himself as precisely as possible. The playwright’s trademark rapid-fire dialogue—distinguished by its colloquial diction, interruptions and thick swarms of obscenities—is written with a precise rhythm in mind. He has been known to use a metronome during rehearsals to perfect the actors’ delivery of his language. The month of November brings to mind two great American traditions: Thanksgiving and — especially in years divisible by four — elections. Leave it to David Mamet to invent characters who desecrate both. 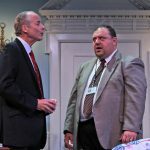 “November,” making its Long Island premiere with rapid-fire political incorrectness, is a pie-in-the-face short of circus-clown farce. What’s new, you ask, given the current state of uncivil civic events? But when you drag Thanksgiving into the mud, too, well, now we’re talking turkey. Perhaps the calendar explains why “November,” then starring adorably glib Nathan Lane, flopped on Broadway in 2008, the election year that ushered in the Obama presidency. Opening in January, “November” barely made it past the Fourth of July. 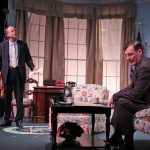 Premiering on the evening after the final presidential debate, the Hampton Theatre Company’s production benefits from better timing. “It’s always something,” Botsford as commander-in-chief concedes. Any similarities to the 2016 campaign are purely prescient as George W. Bush was entering the final year of his second term when “November” debuted. Smith is a week out from the election that polls insist will make him a one-term president. Obsessed about “legacy,” he wants a library, or perhaps a last-minute ad buy that will rescue him. An opportune visit by the turkey lobbyist (a solicitous Matthew O’Connor), for the annual gobble-gobble pardon, gives the president an uncharacteristically brilliant shakedown idea. There’s a war going on — Smith can’t remember whether it’s with Iran or Iraq — but the president is so obsessed with his kickback scheme that he keeps Israel waiting on the red hotline. The conscience of the Smith administration is a lesbian speechwriter (an earnest Rebecca Edana), who agrees to abet her boss’ pay-to-play gambit if he’ll marry her to her partner despite its illegality (except in Massachusetts) in 2008. Rob Byrnes as an aggrieved Indian nation chief sets off the killer finale. Don’t be afraid to laugh out loud, however incorrect it all seems. Remember, it’s only a play. Reserve tickets here, or call OvationTix at 1.866.811.4111. 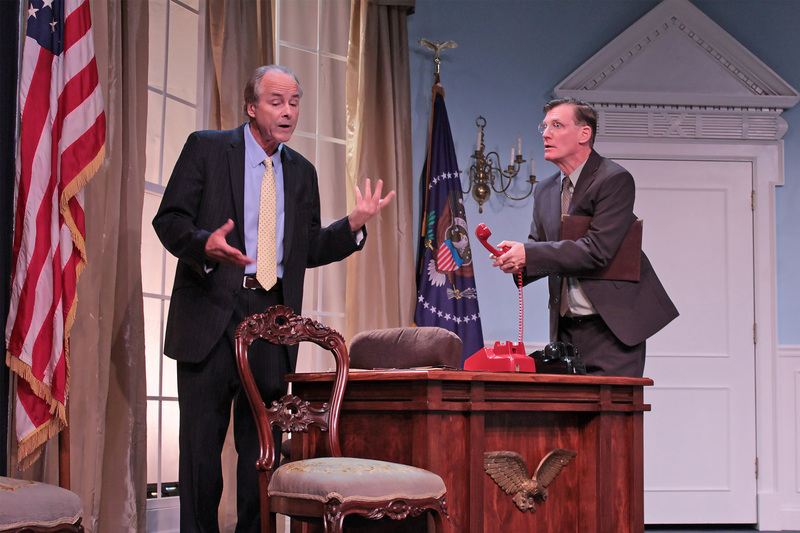 What a prescient choice the Hampton Theatre Company made when they chose “November” for their fall production in this election cycle! Who knew that in real life we would have the same kind of flim-flam man dominating the news as his fictional counterpart in David Mamet’s wonderfully un-PC satire set in the Oval Office? So begins the second act. The script adheres to no particular president or party. 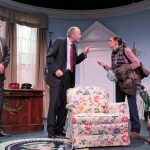 The conniver-in-chief desperately seeking reelection on stage stands in for all political stripes, for Mamet reminds us of political missteps and scheming of multiple presidents, from Nixon to, well, you fill in the blanks. 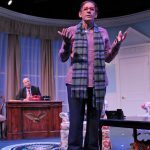 As Diana Marbury, who directed this timely gem, introduced the play and the 32nd season of the Hampton Theatre Company, she warned the audience that there’s something in it for everyone to be offended. There’s the offstage First Lady who sees the end coming and wants to know if she can take the couch in the Oval Office. There’s the straight man—actually a lesbian here—speechwriter who’s just come back with a baby from China, where the country sells “the fruit of their wombs” for $25,000. No, wait, that’s for administrative fees—not the baby! If that zaniness, worthy of stand-up comedy, isn’t enough, the plot line soon devolves into a nutty verbal farce around squeezing the representative of the national turkey manufacturers to come up with $2 million before his two turkeys get their annual “pardon,” and Thanksgiving is celebrated by chowing down on all those who aren’t so fortunate. Without the cash, President Smith just might pardon all the millions of turkeys in the United States, thus giving pork—or maybe, cod—producers a windfall. What did the pilgrims eat for their first Thanksgiving anyway? President Smith is cash poor. His party has deserted him, as his poll numbers rival “Gandhi’s cholesterol numbers.” A Native American chief in appropriate headgear storms in wanting 4,000 acres on Nantucket for a casino before he hands over his moolah. His earnestly liberal speechwriter wants the president to officiate her wedding on national television—before the turkey pardoning. Don’t expect Mamet, one of a handful of America’s most celebrated playwrights, to deliver some profound message or sermon as he has many times elsewhere; here, he’s merely baring the absurdist stew of many a political campaign, and with a rich soupçon of irony. Which is precisely why “November” is such fun right now, just as his “Wag the Dog,” for which he shared screenwriting credits, was, in 1998. If Donald Trump weren’t writing his own best lines, one might think that Mamet had stepped in as his scriptwriter. HTC regular Andrew Botsford, as President Smith, is at his comedic best here, throwing off his one-liners with brash aplomb and so much candid venality that you almost love him. 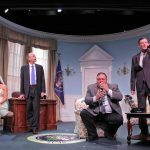 Matthew Conlon is the chief of staff, Archer Brown; Rebecca Edana is the sincere speechwriter, Clarice Bernstein; Matthew O’Connor is the turkey lobbyist; and Rob Byrnes is the demanding and ridiculous Chief Dwight Grackle. Together, they put on one hell of a show, cavorting through the pointed script and punching it for all its humor. Opening night, they were rewarded with a richly deserved standing ovation. 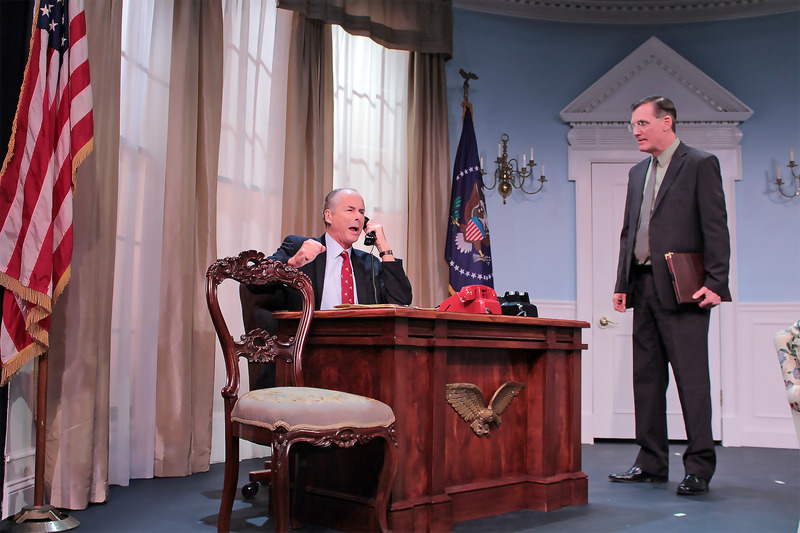 When the play premiered on Broadway in 2008, it was the early stages of the primary season, and an unpopular George W. Bush was in the Oval Office. With sliding popularity numbers. “November” lasted only about six months on Broadway. But today, in the Hamptons, it is the welcome antidote to the wall-to-wall political coverage of a campaign that is hard to believe and exhausting pretty much everybody who is paying attention, as I am. 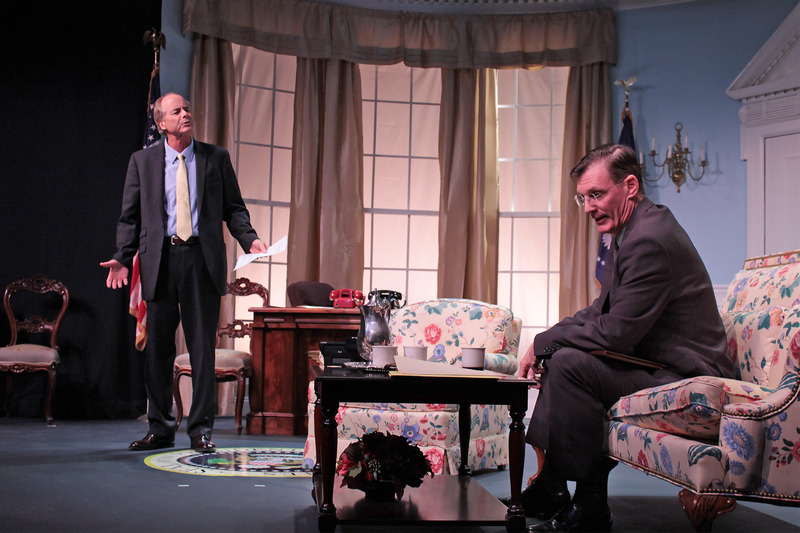 The staging at the Quogue Community Hall ends November 6, two days before the election. I exited laughing. You will too. 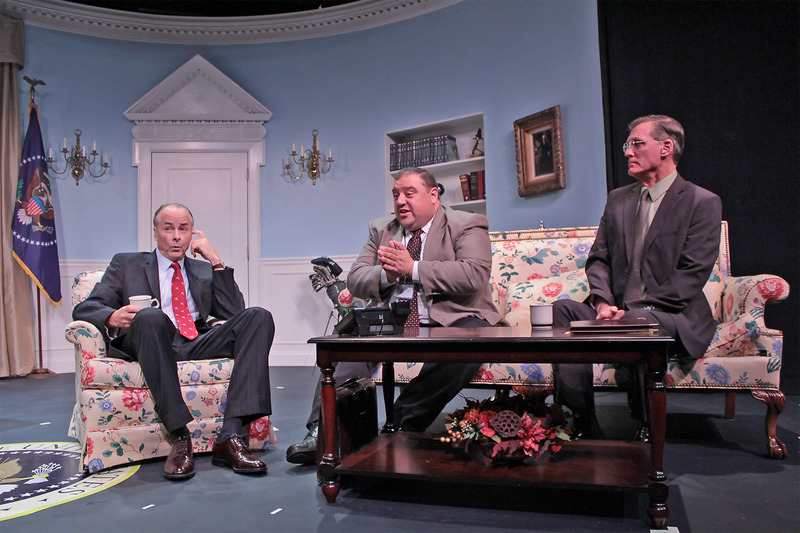 “November” continues at Quogue Community Hall, 125 Jessup Avenue, Quogue, with showtimes Thursdays and Fridays at 7 p.m., Saturdays at 8 p.m. and Sundays at 2:30 p.m. There will be an additional 2:30 p.m. matinée on Saturday, November 5. Regular admission is $30. Seniors 65 and older pay $25, except on Saturdays. For those younger than 35, admission is $15, or $10 for students under 21 with ID. 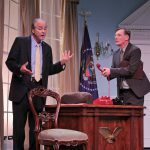 Just in time for the home stretch of an R-Rated presidential election season, Hampton Theatre Company brings David Mamet’s “November,” a hilarious and scathingly satirical take on American presidential politics, to the Quogue Community Hall for their season-opening production. The play opens on October 20 and runs through November 6. “November” drops in on first-term U.S. President Charles Smith in the final week before Election Day. While his party affiliation is neither clear nor relevant, one thing seems certain: this egomaniacal and irredeemably venal politician has no chance of winning reelection. With approval ratings near zero, he’s been abandoned by his reelection committee, has run out of money and his wife is preparing to move out of the White House. Still, President Smith isn’t ready to give up just yet, and he sees a glimmer of hope when the Turkey Representative comes calling at the White House seeking the traditional Presidential pardon of the Thanksgiving turkey. But in order to make the biggest deal of his presidency, Chuck will need all the help he can get from his chief of staff, Archer Brown; his brilliant speechwriter, Clarice Bernstein, and Chief Dwight Grackle of the Micmac Nation. Premiering on Broadway in 2008, “November” remains eerily relevant in this 2016 election season. 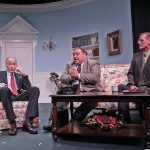 With Mamet’s trademark no-holds-barred, politically incorrect and profanity laden style, the laugh-out-loud comedy is a caustic characterization of the egomania and moral elasticity that infect too many politicians, and the kind of power-madness that’s a danger in any elected official. The cast of HTC’s “November” features four of the company’s veterans and one newcomer. Playing Charles Smith is longtime HTC company member Andrew Botsford, last seen as Vanya in the 2016 production of “Vanya and Sonia and Masha and Spike.” Matthew Conlon, last on the HTC stage in “Clybourne Park” and “Hay Fever” in 2015, has the role of chief of staff Archer Brown. Rebecca Edana, who most recently played Bella in HTC’s 2016 production of “Lost in Yonkers,” is head speechwriter Clarice Bernstein. 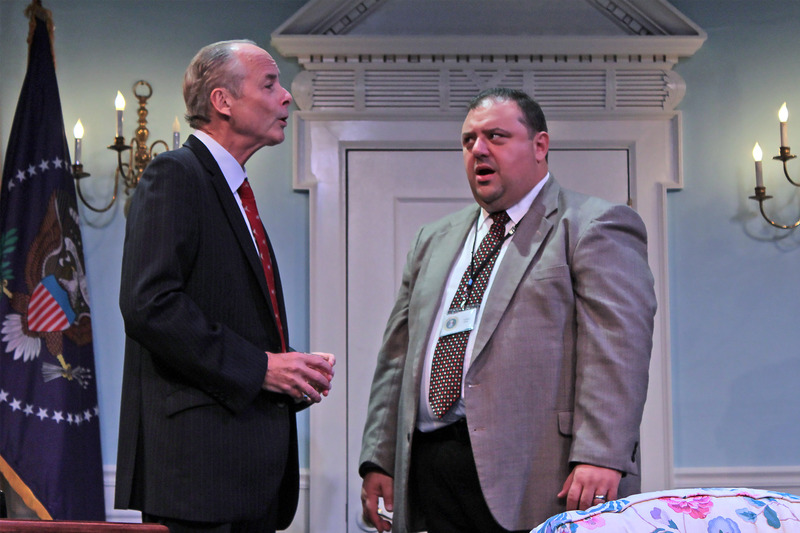 Matthew O’Connor, last on the Quogue stage in HTC’s “Bus Stop” in 2008, plays the Turkey Representative, and newcomer Rob Byrnes has the role of Dwight Grackle. HTC Artistic Director Diana Marbury directs. Set design is by Sean Marbury; lighting design by Sebastian Paczynski; and costumes by Teresa Lebrun. As a playwright, David Mamet is perhaps best known for Glengarry Glen Ross (produced by the Hampton Theatre Company in 2008). The 1982 hit won him the Pulitzer Prize for drama as well as the New York Drama Critics Circle Award, and he later adapted it for the big screen, garnering an Academy Award nomination. His work is characterized by dark themes played out by often desperate characters who veer from the truth to manipulate others for their own selfish ends. 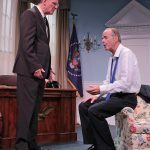 Mamet’s trademark rapid-fire dialogue is distinguished by its colloquial diction, interruptions and thick swarms of obscenities, and is written with a precise rhythm in mind. New this season, the HTC is offering $15 discount tickets for audience members 35 and under, and an additional matinee performance on the final weekend of the production, on Saturday, November 5, at 2:30 p.m., prior to the regular 8 p.m. performance that evening. Tickets are $30 for adults and $25 for senior citizens over 65. Shows on Thursdays and Fridays are at 7 p.m., Saturdays at 8 p.m. and Sundays at 2:30 p.m. 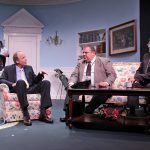 The Hampton Theatre Company will again be offering special dinner and theater packages in collaboration with the Hampton Bays, and Quogue libraries. Information about the dinner and theater packages is available under Theater and Dinner Packages tab on this page, or through the libraries. 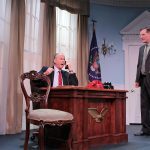 In 2008, when David Mamet debuted “November,” his play about the madness of American politics, he could have hardly foreseen the season of Hillary Clinton and Donald Trump. But he sure tried. This satire’s central character, Charles Smith, is a sitting president up for re-election, and if that situation is not currently relevant, then nearly everything else in “November” is. President Smith is a man beset by minority special interest groups, gay rights coalitions, and questions about campaign contributions and the funding of a presidential library, not to mention being torture-happy and on the political take. His popularity score hovers right around Clinton’s and Trump’s recent approval ratings. “What is it that people don’t like about me?” Mr. Smith asks his adviser Archer Brown. “That you’re still here,” is the reply. 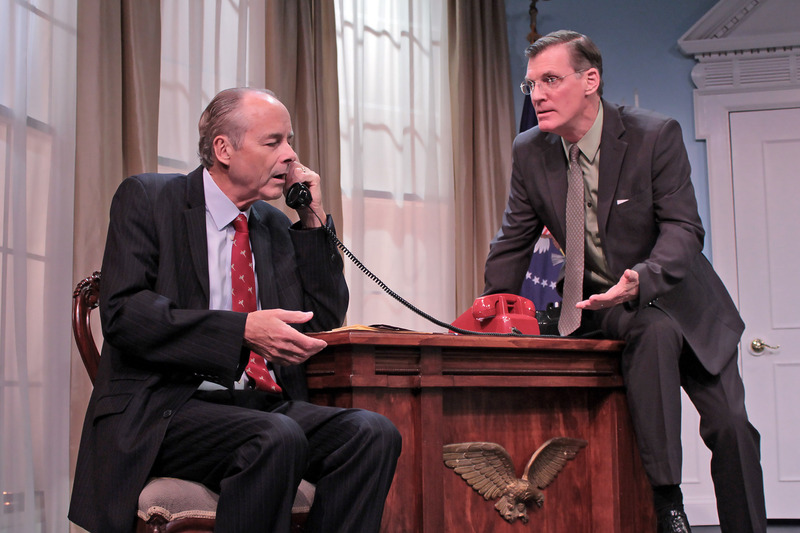 Of course, staging a David Mamet play can be tricky business. With his syncopated language and arch staccato rhythms, Mr. Mamet may be the most singular of American playwrights; revivals of his work have had mixed success. 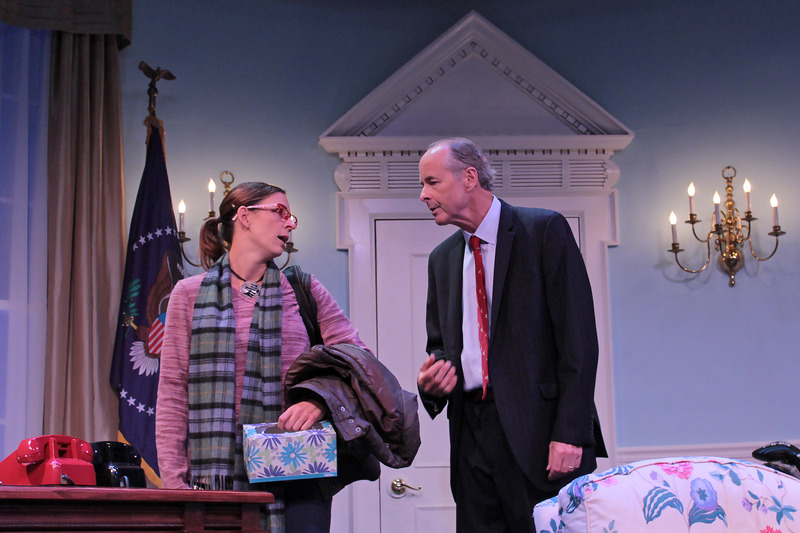 “November,” however, is one of his least idiosyncratic plays, relying more on broad humor and less on stylized dialogue. 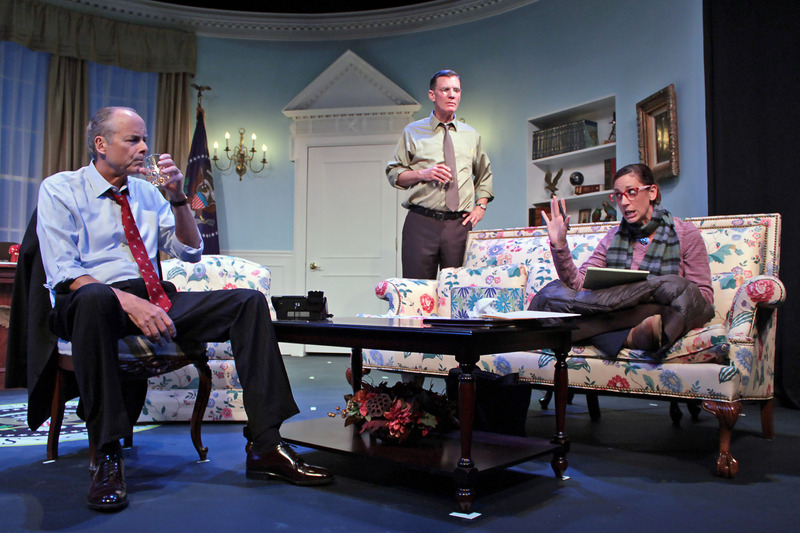 In fact, there are times when it seems more like an episode of HBO’s series “Veep” than a Mamet play. 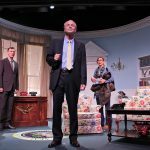 This makes it low-hanging fruit for restagings, and the deft players of the Hampton Theatre Company dig out nearly all of the comic nuggets in its text. President Smith is not only harried and uninformed but spineless, and seems to rely on his adviser for the most basic information (he’s not even certain if his country is at war with Iraq or Iran). Though the election is still ahead, his wife has already made arrangements to remove a couch she loves from the White House, and though he has promised her there will be a presidential library in his name, he has raised only $400,000 so far toward that end. When a representative from the turkey farm lobby enters the Oval Office offering a payola scheme for the “pardoning” of two turkeys, the plot is off and running. There are moments in the first half of “November” when the comedy doesn’t quite hit its mark, but this seems more the fault of the text than this faithful production. Mr. Mamet has always been primarily a dramatist with comedic flourishes rather than a writer of flat-out farce, and occasionally there is a lack of snap to the humor. But things begin to warm up in the second half, and soon all the jokes are landing, the audience reaching a point of giddy exhilaration as the play coasts from one hilarious absurdity to the next. This has a good deal to do with the appearance of the character Clarice Bernstein, President Smith’s lesbian speechwriter, who tries to pressure her boss into officiating at a civil ceremony for her and her partner (this was before gay marriage) on national television. Ms. Bernstein is played by Rebecca Edana. As happened in her performance in last year’s “Lost in Yonkers,” the quality of the production seems to rise whenever she’s on stage. Bernstein is a farcical character meant to further taunt the beleaguered president, but Ms. Edana treats her longing to be married with such feeling that it momentarily lifts the play into something beyond mere comedy. 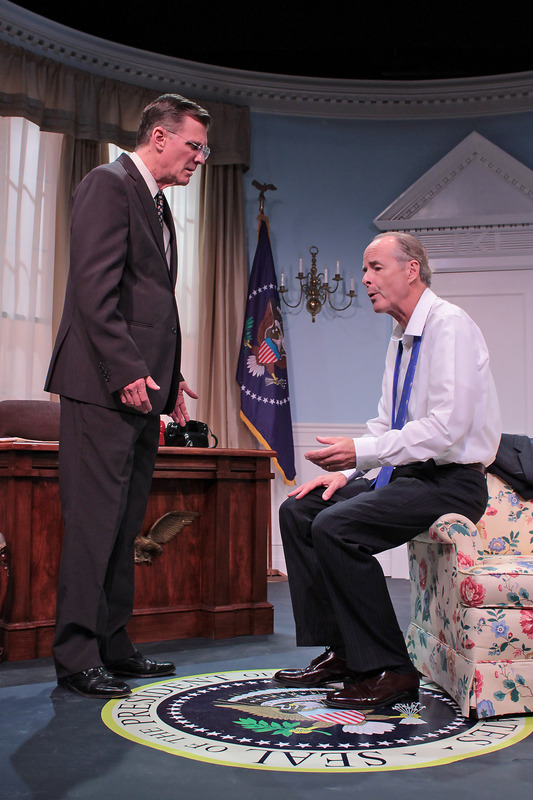 Andrew Botsford takes on the role of President Smith with sniveling gusto, succeeding in making him likeable despite his many abhorrent qualities. It doesn’t hurt that he has a great straight man in Matthew Conlon, who plays Archer Brown with wicked cynicism. 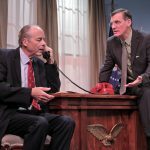 In the play’s last leg, when Archer is trying to explain to his boss the technical nuances of the word “legal,” the performances a jazzy timing that seems to capture the best of Mamet’s rhythmic demands. While President Smith seems at least partly based on George W. Bush, you don’t need a political affiliation to appreciate “November.” In fact, fans or detractors of either of our current candidates will find plenty of red meat in Mr. Smith. When pushing executive legality to its limits (and often beyond), the satire seems directed specifically at Mrs. Clinton, while Mr. Smith’s bigotry echoes some of Mr. Trump’s saltier rhetoric. Mr. Mamet is too good a writer to indulge in mere political ideology; with “November” he has nothing less in his sights than the entire American political scene. 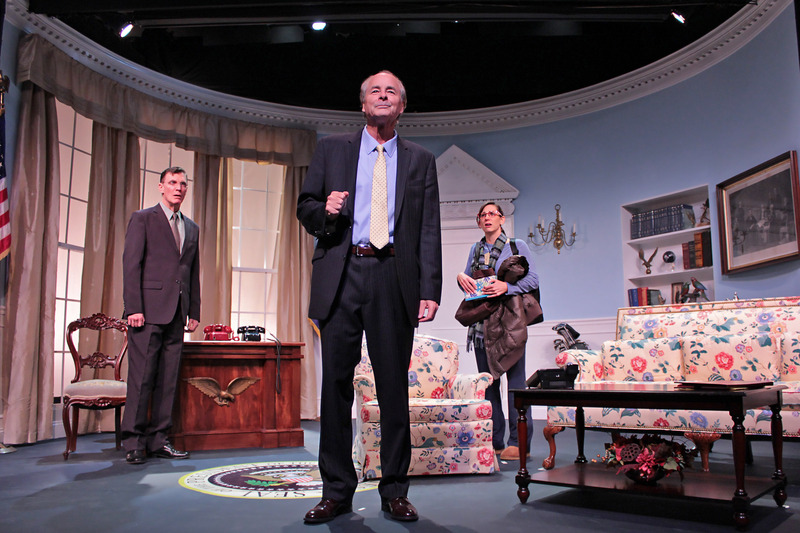 As we wind down from another crazy and exhausting election cycle, it’s hard to think of a better tonic than a night with President Charles Smith and this pleasing Hampton Theatre Company production. When you have a David Mamet play – in this case November billed as political satire – with a cartoon turkey on the cover of the playbill, then you know you are in for an evening full of laughter. 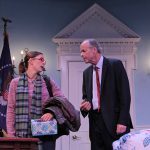 This show, which premiered on Broadway in 2008, is being mounted by The Hampton Theatre Company at a perfect time given the tumultuous political time we’re currently in. 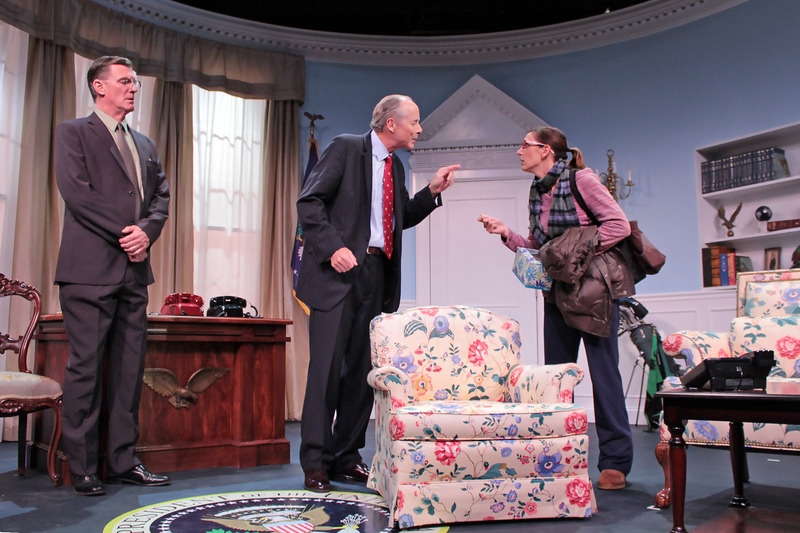 In other words, this production will make you laugh even more at politics. 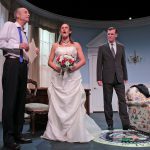 Running through November 6th, this incarnation, excellently directed by Diana Marbury, boats an absolutely superb cast. 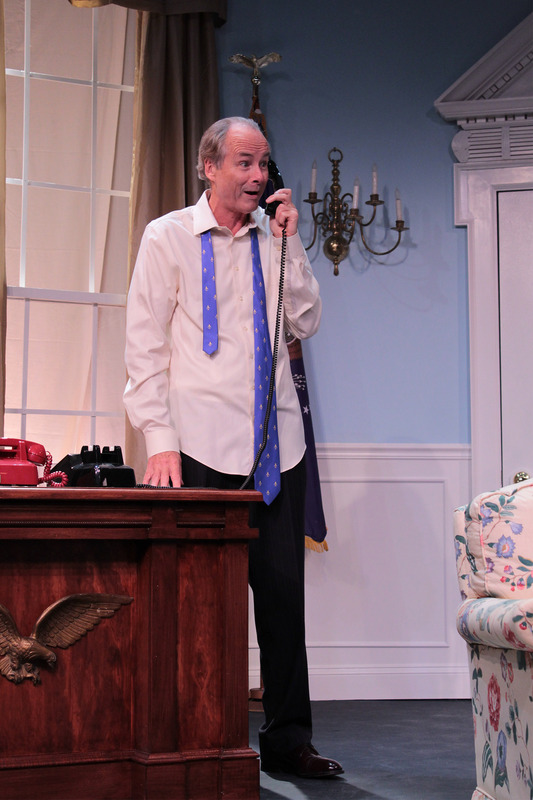 We first meet current U.S. President Charles Smith strongly portrayed by Andrew Botsford (played by Nathan Lane in the Broadway incarnation). It isn’t clear which party he represents and he is irrefutably and incurably corruptible. With his approval rating near zero, he is abandoned by his party during an election year and we follow Smith freaking out desperately trying to get money together to get re-elected. His staff, too, has given up hope. 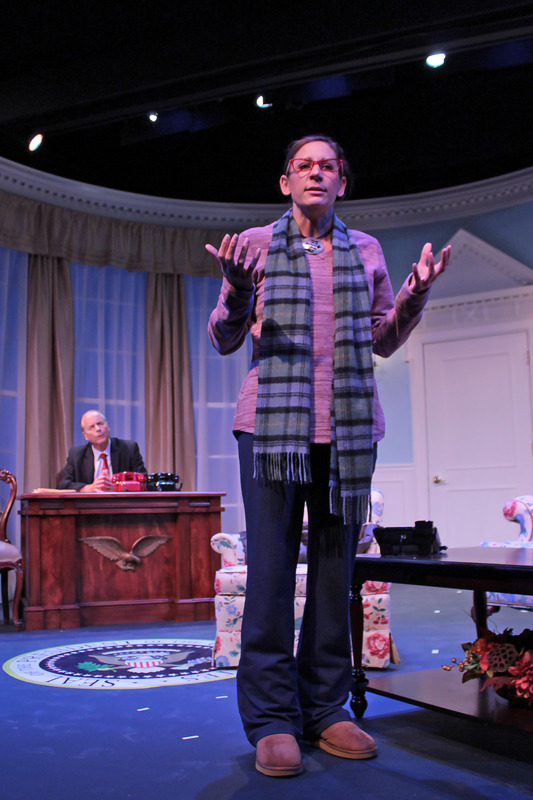 His speech writer, Clarice, portrayed by Rebecca Edana (portrayed by Laurie Metcalf on Broadway) has written his farewell speech just days before people even hit the polls. 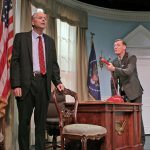 And Smith’s advisor, Archer Brown, portrayed by Matthew Conlon (portrayed by Dylan Baker on Broadway), tells him MANY times to just give up. The entire cast is truly superb with their on-point comedy and the laughs are unfailing throughout the show. Also a highlight is the beautiful set designed by Sean Marbury. Set in the oval office, the President’s desk is off to one side with a chair/coffee table set on the other. 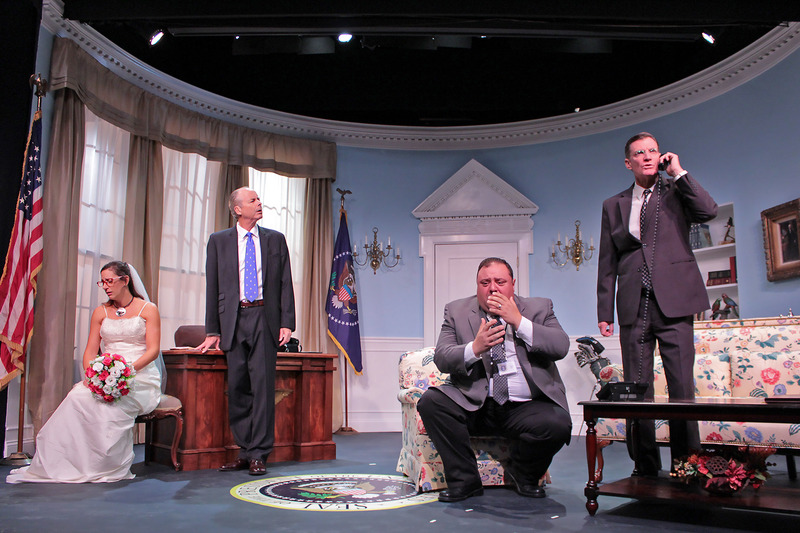 Blue and white walls encompass the intimate stage and they even replicate the presidential seal on the floor. This was enhanced beautifully by Ms. Marbury’s set décor and Teresa LeBrun’s clever costumes. And so, Mr. Mamet’s archetypal no-holds-barred style absolutely shines in November. Its side-splitting, scathing depiction of political corruption that infects too many politicians obviously remains uncannily relevant in this election season. Attend this delightful play with an open mind and a good sense of humor because everyone is made fun of. 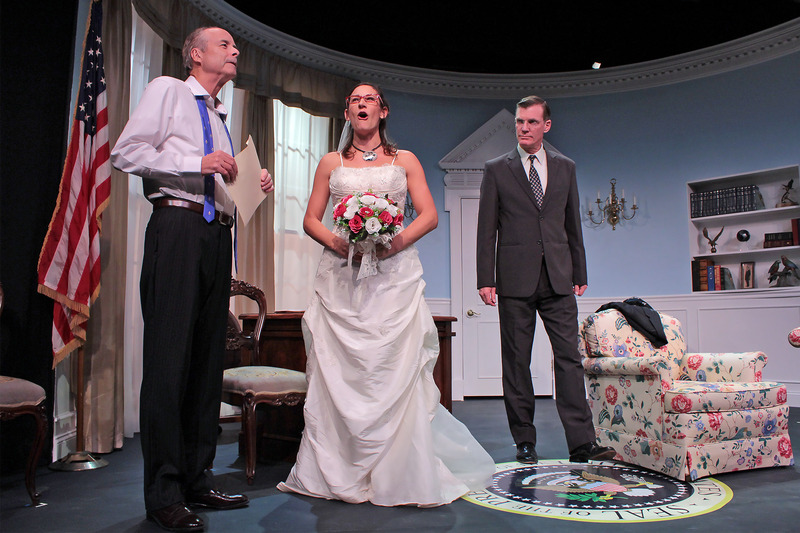 November is presented by the Hampton Theatre Company through November 6th at the Quogue Community Hall. Reserve tickets here, or call OvationTix at 1.866.811.4111. Both my husband and myself enjoyed the show last night. It was “laugh out loud” funny!! Looking forward to the next production from the Hampton Theatre! It was wonderful-acting was superb!!!!!!! Thanks. What an outrageously funny show! Mamet would be f***ing proud! Time flew by. I loved it! We enjoyed the show. It was very funny. I love your theater. It’s close to home and you present a variety of good shows. Thank you. Loved the play and of course it was very timely! The actors and direction by Diana Marbury were as always exceptional! Well done! Great play. Andrew Botsford was outstanding. Wonderful comic relief for the current election season! 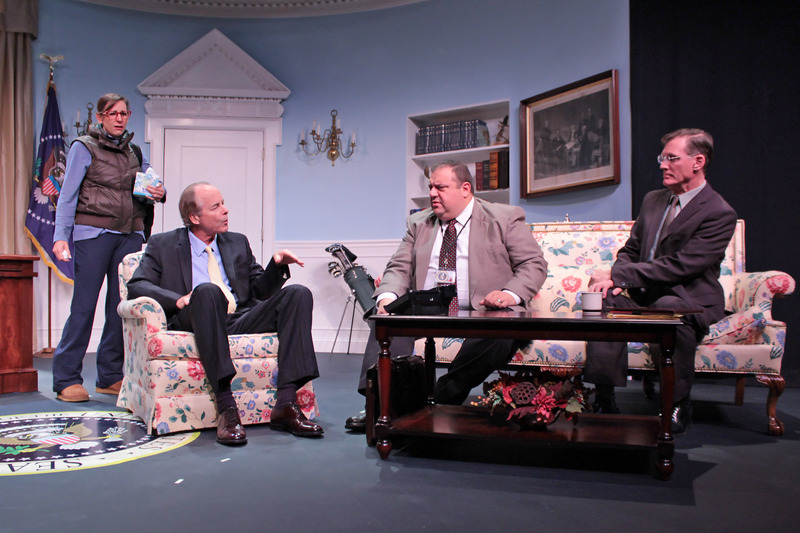 Thank you for a wonderful performance of November this past Friday night; the show was hilarious! Such a talented group of performers! We laughed out loud with each character. This satire is truly an entertaining break from the antics of the daily politics we’re enduring each day! We are happy to recommend this show…as we live on the North Fork, we’ve been telling friends it’s well worth the drive!! I laughed so loud I was afraid I would be asked to leave. All the actors just blended together so well. It was a great performance by everyone and a perfect play to start the new season. I had seen Nathan Lane’s “Novembr” president . It took me a while to get used to Andrew Botsford’s quieter, quirkier, more nuanced president. But I loved it. I thought there was something Biden-esque about his portrayal.